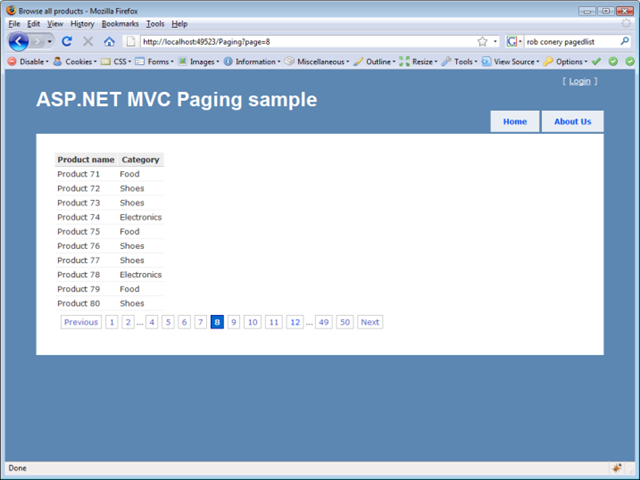 On my latest gig, we used ASP.NET MVC and it was a very pleasant experience! Very clean code, clean html output and the productivity was great (which is not very common when using a technology for the first time). Of course, since ASP.NET MVC isn’t finished yet, it leaves something to desire. At one time we needed paging and there isn’t an out-of-the-box solution for it (yet). Some googling revealed that others had already addressed this, but to be honest, I wasn’t entirely pleased with the solutions, so I grabbed the best parts and build a generic solution out of it. First, there was the PagedList<T> that Scott Guthrie already used in one of the earliest MVC demo’s and that later appeared in improved incarnations from Rob Conery and Troy Goode. This was a nice starting point, especially because we also used LINQ To SQL as our data access layer. To provide an extra extension point, I created an IPagedList<T> interface instead of using the PagedList<T> directly. You probably recognize the digg-style appearance of the pager. 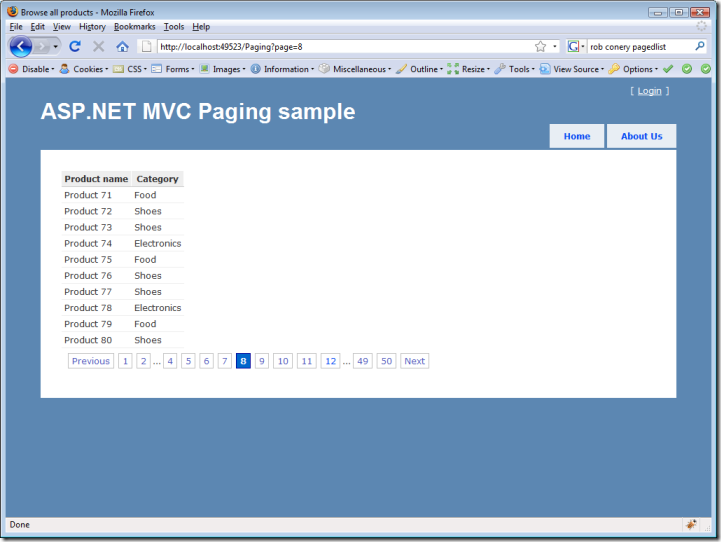 Thanks to the ASP.NET MVC sample application KIGG for inspiration :). 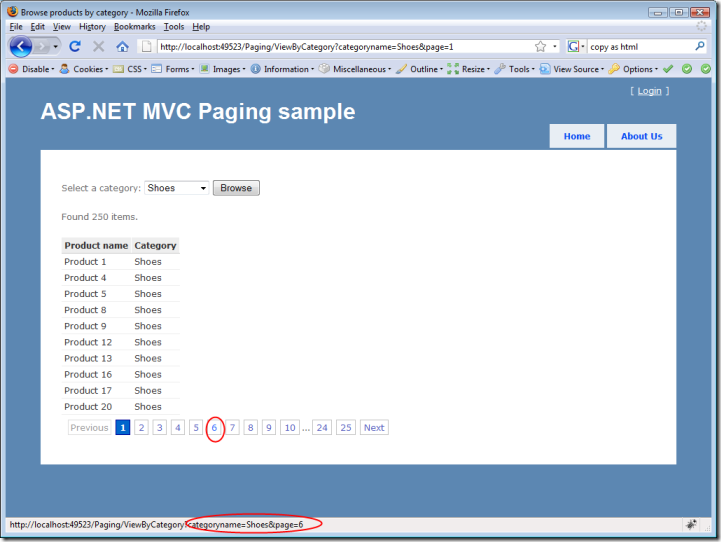 Internally, the pager uses RouteTable.Routes.GetVirtualPath() to render the url’s so the page url’s can be configured via routing to create nice looking url’s like for example ‘/Categories/Shoes/Page/1’ instead of ‘/Paging/ViewByCategory?name=Shoes&page=1’. That’s it. A complete solution with demo project can be downloaded below. Feel free to leave any comments or remarks. One of the things I’m not happy about is that I failed to properly unit test the pager, but that’s for a different post. 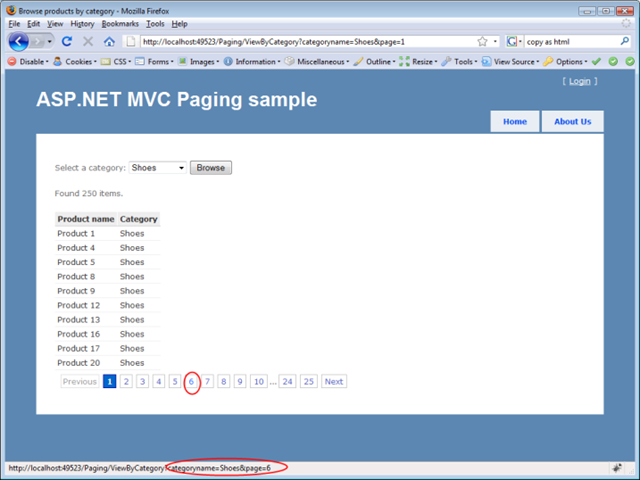 Check also the AJAX version of the pager written by Daniel Iglesias: http://danieliglesiaseng.blogspot.com/2010/01/ajax-paging-with-aspnet-mvc.html.